It's been a long time since I've shared this! Pictured with the monster is a drawing my daughter did when she was about 8 years old (she's now 15). I found it in a box in 2014. It was then I decided to turn it into an amiurumi. The only thing I didn't add into the design was pants. I regret that a bit and don't know why I didn't. However, I do remember my daughter approving of what I did with the pattern. Maybe one day I'll make another one and give it a pair of pants and then it will be just like the picture. If you would like to make one, the free pattern is here. There is also a video tutorial too. Over the last 4 years I've seen many Yarny Monsters posted online and each one makes me so happy! If you ever make one, please post pictures on my facebook page, Amigurumi Freely, I'd love to see it! Thanks for stopping by. Have a yarny day! 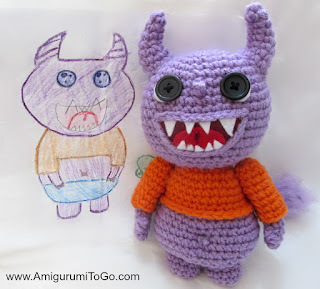 I LOVE your monster with or without pants! I wish I had your talent to crochet something from my kids drawlings! It would be a lot of different cool cars and one son likes to draw eye's! Kids love to color and to tell stories, so having them draw cartoons for an afternoon is a great way to keep them entertained and happy and keep the TV off.